In this Psalm David once again appeals to the Almighty for protection and salvation from the enemies who have risen against him and seek to kill him. 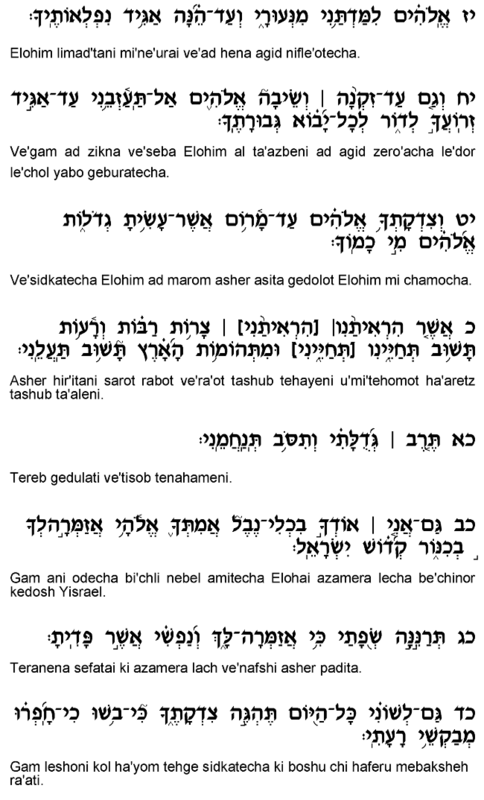 The Radak surmises that this prayer was composed during the revolt of Avshalom, David's son, as evidenced by the references in this chapter to David's advanced age. He recalls how God has always protected him since his youth (verses 5-6) and asks that He not abandon him now, in his old age, when his strength has been depleted (verses 9,18). It appears that David is already an older man, in which case he likely speaks of Avshalom's revolt, which took place during David's older years. David here records the claim made by his enemies that God has abandoned David and he is thus vulnerable and helpless (verse 11). 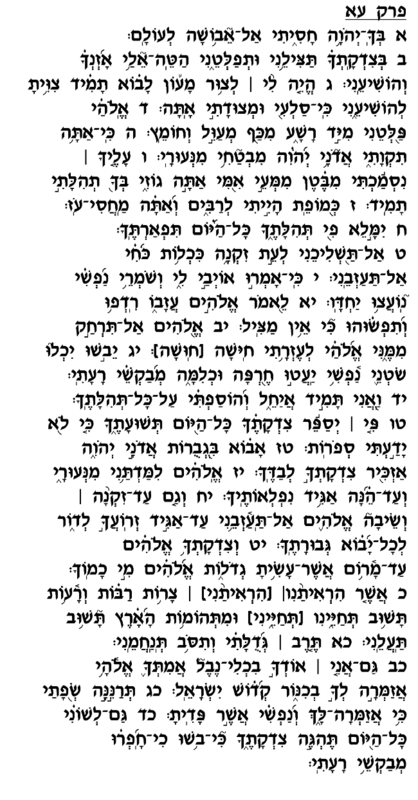 This, too, might support the claim that this prayer was recited during Avshalom's revolt. Avshalom and his followers perhaps wrongly concluded that David is no longer deserving of the throne due to the incident with Batsheva, and this contention may have helped them attract a large following. David thus petitions God to vindicate him by rescuing him from Avshalom to demonstrate that he has been forgiven and is still indeed worthy of serving as king of <?xml:namespace prefix = st1 ns = "urn:schemas-microsoft-com:office:smarttags" />Israel. In verse 20, where David prays that God should "revive" him and raise him from the depths to which he has plunged, several words are written in the plural form though pronounced in the singular form ("Hir'itani," "Tehayeni," "Ta'aleni"). The Radak explains that although David prays for his own personal salvation, he alludes to the general salvation of the Jewish people, as well. Prophetically foreseeing Am Yisrael's exile from their land, David looks upon his flight from Jerusalem during Avshalom's revolt and his eventual return as symbolic of the nation's process of exile and return. Thus, as he prays for his own return to Zion, he also beseeches God that his personal experiences should establish a precedent for his descendants after their banishment from Jerusalem, that they, too, should be granted salvation and brought back to their homeland.